It’s our Big Green Egg Giveaway! That’s right! 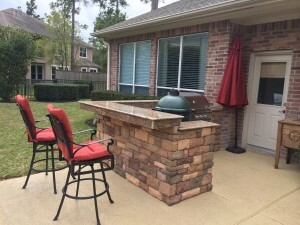 For each outdoor kitchen designed and built by Outdoor Homescapes of Houston, we’re offering a complimentary, large built-in Big Green Egg (valued at $800 and up)! What’s a Big Green Egg, you ask? Well, it’s arguably one of the most well-known, popular kamado-style ceramic charcoal barbecue cookers out there! Kamado-style cookers are derived from an ancient clay cooking device known as a “kamado.” They’ve become increasingly popular in recent years because they cook in a unique style that makes meat unbelievably tender, moist and juicy. 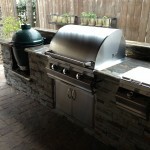 People also like kamado grills because they can be used as ovens, grills and/or smokers. 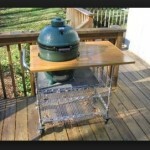 But why a Big Green Egg? Well, of course, there are many other models and brands of kamado grills besides the Big Green Egg. In fact, we also just started offering the charcoal-free Kamado Gourmet for our outdoor kitchens, too. But the Big Green Egg brand is widely acclaimed as the first American-designed model and has become become synonymous with kamado-style barbecue cookers. 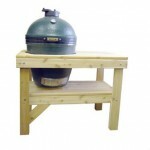 Even if people are talking about a different kamado grill, they often call it a Big Green Egg. Besides, you can’t argue with all of the brand’s top ratings, like this About.com review on the Big Green Egg . 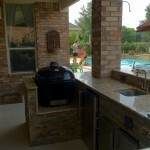 In contrast, our popular Big Green Egg island designs offer a sophisticated, integrated approach, with this kamado-style cooker built into a stone island along with a grill, granite countertops and other outdoor kitchen amenities. It’s about design – one that’s incorporated into your existing space and looks like it’s always been there. Aren’t they gorgeous? 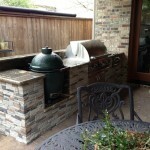 No wonder our Big Green Egg images on Houzz are our most popular! 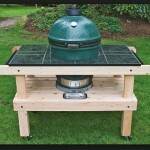 Interested in participating in our Big Green Egg Giveaway? All you have to do is fill out our contact form!